Jefferson Parish Residents only. No commercial waste accepted. The Department of Environmental Affairs, a Keep America Beautiful Affiliate will collect household hazardous materials from Jefferson Parish residents on Saturday, May 19, 2018. The collection event will take place in the Joseph S. Yenni Building parking lot, 1221 Elmwood Park Boulevard between the hours of 9:00am and 12:00noon. Residents should enter from the Citrus Boulevard side of the property. As a state and national Keep America Beautiful affiliate, this endeavor is part of the Parish’s participation in the Great American Cleanup. Jefferson Parish is one of 600 affiliates participating in this national event, which targets waste reduction, community beautification, and other community environmental endeavors. Other partners include the Jefferson Parish Sheriff’s Office, the Capital Area Corporate Recycling Council (CACRC), American Recovery, LLC, OMI Environmental Solutions, the Jefferson Parish Sewerage Department and the Department of General Services. Leftover household products that contain corrosive, toxic, ignitable, or reactive ingredients are considered “household hazardous material or “HHM.” Products, such as paints, common household cleaners, oils, batteries, and pesticides that contain potentially hazardous ingredients require special care when you dispose of them. The improper disposal of household hazardous material can include pouring waste down the drain, on the ground, into storm drains, or in some cases, putting it out with the trash. The dangers of such disposal methods might not be immediately obvious, but improper disposal can pollute the environment and pose a threat to human health. 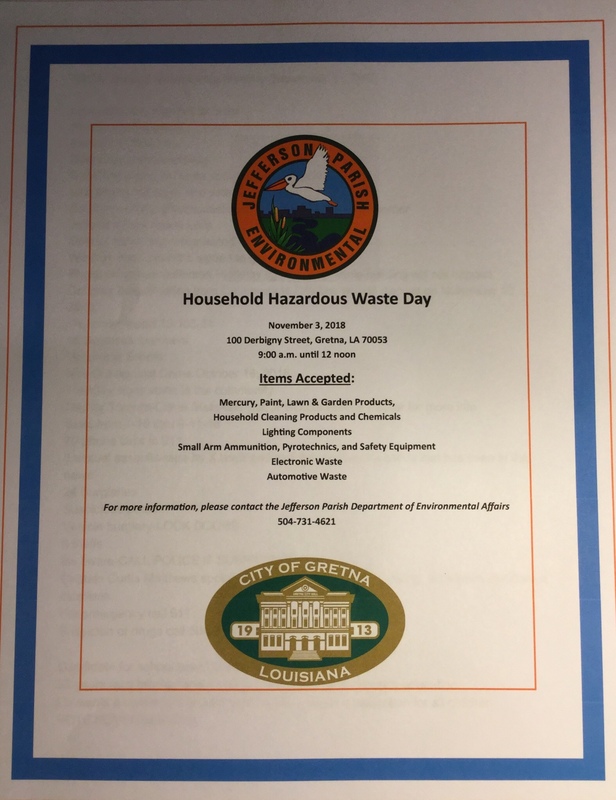 To address the issue of improper disposal, Jefferson Parish Department of Environmental Affairs offers twice-yearly collection of these hazardous materials. Electronic Waste: Computers, LCD monitors, printers, radios, camcorders, VCR’s, CD players, DVD players, MP3 players, telephones, stereos, Xboxes, Play stations, Wiis, digital cameras and digital video cameras, digital picture frames, portable navigation and GPS devices (Garmin, Magellan, Tom-Tom), fax machines, circuit boards (of any type), processors, uninterruptible power supplies (UPS), toner cartridges, ink jet cartridges, televisions, CRT monitors, noncommercial copy machines, printers and power tools. For additional information, contact Michael Lockwood, Director of the Environmental Affairs Department at (504) 731-4612. The Jefferson Parish Public School System has received applications for superintendent. We are looking for questions that are important to you and your community for the superintendent candidates to answer. 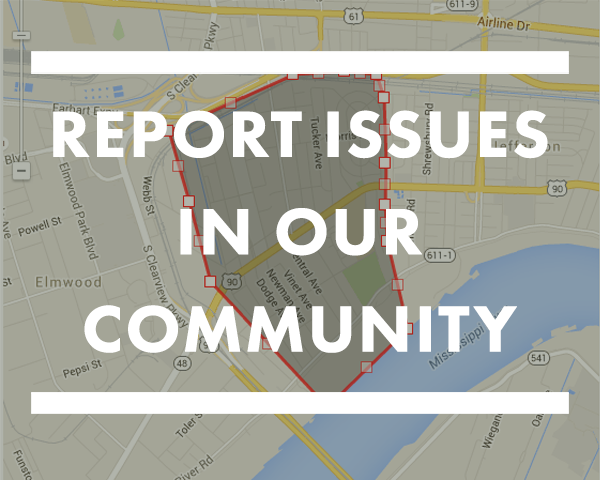 We are asking that you please share the following message with your civic group. The Jefferson Parish Public School System (JPPSS) and the Jefferson Parish School Board (JPSB) are seeking the input of all stakeholders as we select a new superintendent. 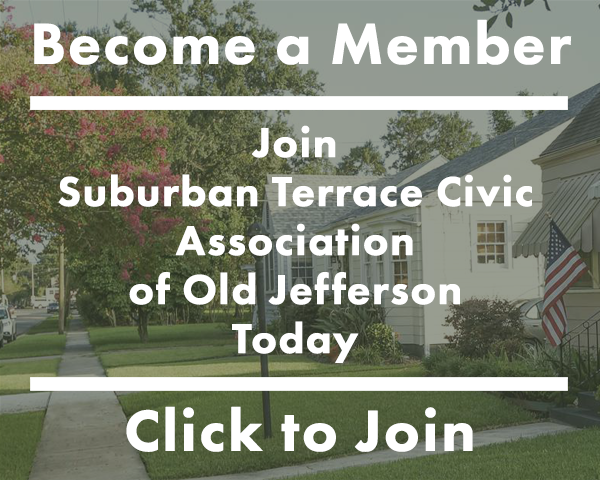 A JPPSS stakeholder is anyone who is impacted by the success of our district: students, teachers, staff, parents, extended family, business & community leaders, etc… If you live, work, or have a vested interest in the success of Jefferson Parish, we want your help. The JPSB is holding a special meeting on Monday, March 5 for the superintendent candidates to answer questions from the board and from all JPPSS stakeholders. You can submit questions online at jpschools.org/SuperintendentSearch. Questions may also be hand delivered to the JPPSS Administration Building at 501 Manhattan Blvd. in Harvey or the Paul Emenes Building at 822 S. Clearview Pkwy. in Harahan. All questions must be submitted in writing. The deadline to submit questions is Friday, March 2 at 12 p.m. This Special Session meeting will be held at the JPPSS Administration Building at 501 Manhattan Blvd. in Harvey at 6 p.m. If you have any questions about this process, please contact JPPSS Community Engagement Director Christie Gomez at christie.gomez@jppss.k12.la.us. Recently, there have been items stolen from our neighbors’ front porches and lawns including: benches, statues and other lawn ornaments. Thieves then resell these items quickly, and a few items have ended in area shops. JPSO advises that items must be identifiable to facilitate their return. Take this opportunity to photograph, and mark these items in a discreet place with a Sharpie or other identifying mark. Please report any theft of property even if it is minor by calling 911 as this is how JPSO receives non-emergency calls. This will assist Officers to identify patterns of crime, and target patrols. This effort will help us discourage theft, and reduce crime in our neighborhood.